Tindari is a place that has it all --breathtaking scenery, Greek and Roman ruins, mosaics, the famous Black Madonna of Tindari, myths, and miracles. Driving along the autostrade from Messina to Palermo on the northeast coast of Sicily, you will see a striking church high, high on a cliff. This is the highest point of the Cape of Tindari, above the town of Patti. The Black Madonna of Tindari is one of the many historical mysteries and the holiest icon of the island. What I didn't realize at first was that this was not just a religious Catholic pilgrimage shrine, but also a very old and important historical site. Tindarus, as it was called, was settled during the Bronze Age (about 1500 BC). The Syracusan Greeks refounded it in 396 BC, and in 254 BC it became a Roman city. There is much to see there today, both Greek and Roman. A comparative religionist Stephen Benko points to the erection of churches housing black madonnas on the sites of former temples to Cybele, as is this one in Tindari. Anyone who knows me knows that I have "a thing" for madonnas and mosaics. So, I was ecstatic to find both at Tindari in the Sanctuary of the Tyndaris Madonna. The church itself was built in the past century and is a beautiful stone structure decorated inside with rich mosaics. 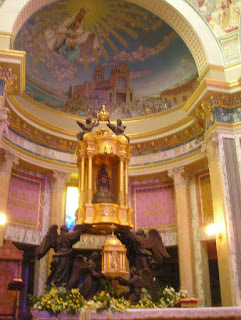 Its whole purpose, however, is to house the Black Madonna, which is very old and of unknown origin. Some say the dark wooden statue was sculpted by St. Luke himself, and that it washed ashore in a small casket, perhaps as early as the 7th century. Others say that she originated in ancient Byzantium and "legend tells that a group of fishermen found it after it fell off a ship bound from the Orient, and handed it over to the local monks. These monks built a sanctuary for it." The most famous legend says "that once a pilgrim was most disappointed on seeing the Black Madonna and made some disparaging remarks. A short time later the child of the impertinent pilgrim fell over the cliffs. As proof of her mercy and also of her power the Madonna caused the sea to recede and soft cushions of sand to form and catch the child as it fell. It is then that she is supposed to have said 'Niger sum, sed formosa.' (I am black and beautiful.) 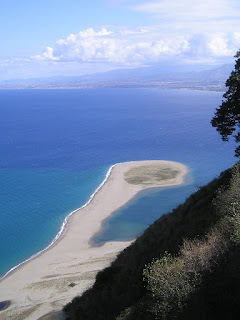 Since then, Tindari has sat in state above the Mare Secco, the 'dry sea'." Statues of two women, justice and equality, stand near her. It is indeed the Black Madonna that draws most of the Italian visitors to Tindari, but I discovered that there is much, much more. Beyond the church and the gorgeous clifftop views of restaurants, beyond the tiny town, you will find an amazing Roman-Greek archaeological site with yet another Greek theater and the remains of a very large building called a basilica like I have never seen before in Sicily. 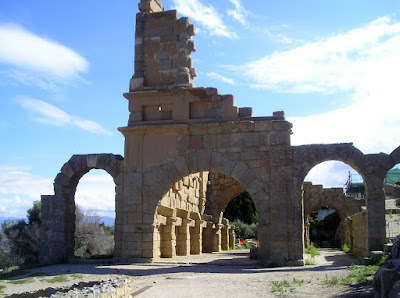 This Roman basilica, though, was a "public meeting house," not a temple or church . It straddles the main road, so archaeologists think it may have been a huge gateway into the main square of the city. Four arches still remain, although there were five originally. It is definitely cool to look right through the remains and see the modern church with the Black Madonna in the distance. All around are extensive remains and ongoing excavations of this Roman city that contained a forum, baths, houses, and taverns. It is humbling to think that this place, alive today with tourists, souvenir shops, and buses, has been a special place to so many different people for thousands and thousands of years. What Goethe once said about Sicily is true: "a marvelous place . . . where many rays of Universal History converge." One of the most memorable events of my stay here in Sicily was attending a performance of an original Greek play by Euripedes in an original Greek theater in Siracusa last May. Every year, or maybe every other year, the National Institute of Classical Drama produces two such classical plays in this theater, which is much like the other theaters I've seen at Taormina, Segesta, and Tindari. The seating is semi-circular and rises up above the stage below. They are built with an open backdrop on spectacular scenery. I would guess the one in Siracusa also was like that, but now there are trees and a modern city behind it. 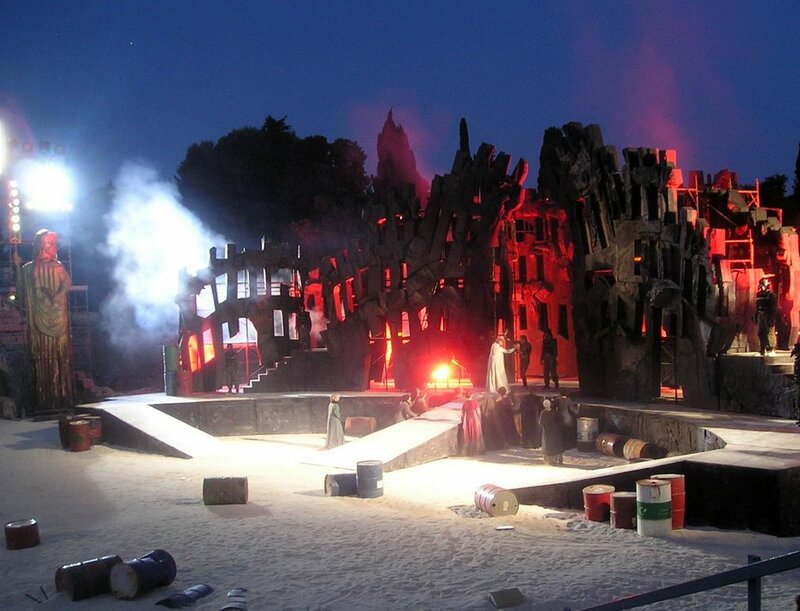 Still, the setting is very special, very old, and perfect for a play from 415 BC. This particular play, Troiades, is "one of Euripides' greatest anti-war plays." Although it was performed in Italian, I had read the summary and was able to follow it fairly easily. Basically, the city of Troy had fallen to the Greeks and the women of Troy were waiting to be handed over to their new Greek masters. In fact, 95% of the characters were female. There is a lot of weeping and wailing and hand-wringing, women in chains, the killing of offspring, the eventual departure of all the women with Troy "burning" in the background, and DRAMA. 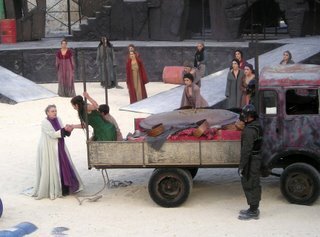 The staging was really very cool, a combination of modern and classical (like an abandoned truck as a wagon and the actors in Greek robes). 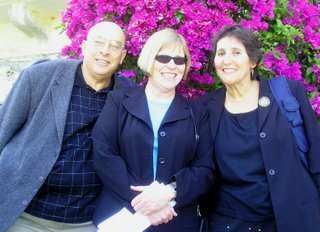 I greatly enjoyed it, and even moreso because I was in the company of my two new friends, Fran and Steve, Americans living on the other side of Sicily. Fran was a fellow blogger (Sicilian Mama), which was how I met her. We had corresponded and finally arranged to meet in Siracusa for this play. We had a grand time together and made plans for more. Unfortunately, Fran's time in Sicily was cut short by her unexpected death to leukemia just last month. I miss her and know that many people feel a great loss. I don't think I would have the experience of seeing this play if it weren't for she and Steve arranging it and inviting me. And for that, I'll always be grateful. This posting is for her. 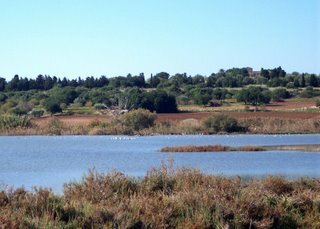 Vendicari (ven-DEE-cah-ree) Nature Preserve near Noto in southeast Sicily is the "last autorest on the autostrada of migration," according to the Italian naturalist who was our guide, meaning that all the migrating birds of northern Europe MUST stop here on their way to Africa. Thus, it is a birdwatcher's paradise, and a great place to try out the new binoculars that Susan gave me for my birthday in December! 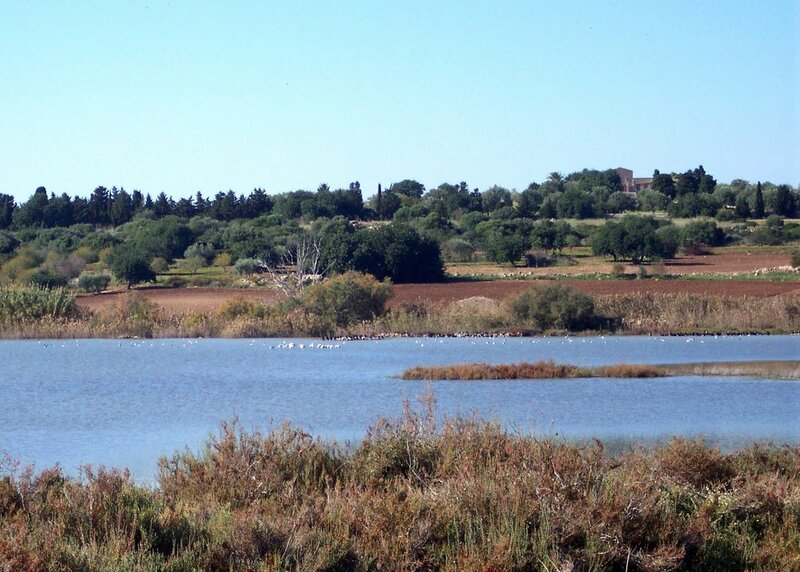 I really didn't know a thing about birdwatching, but it turned out to be pretty interesting, since there were lots of birds, even some rare ones, to see at Vendicari. The only ones I can remember are the flamingos and a raptor. Flamingos, for your information, are not always pink, but become so if they eat certain foods. A raptor is not a flying dinosaur (ala Juraissic Park), but actually a bird of prey, like a hawk. If you look at the photo above, you'll see both of those rare birds! Our naturalist-guide was an expert on everything in the preserve, not just the birds, as he instructed us on the history and plant life there. There aren't too many preserves like this in Sicily, especially right on the beach, he pointed out. But it really was a major stopping point for the migrating birds and needed to be protected. In ancient times, this place was a salt flat, just like the ones on the west coast of Sicily that still operate. Sea water was brought in and the salt was collected as it dried out. You can still see the foundations or outlines of the operation. He demonstrated how salty the land and water still are there by breaking off a grass-like weed and sucking the salt water out of it. I did the same, and it was really salty. Another unusual thing he described to us were the "sea balls" that were found here, washed up on the beach and piled along the edge of the sand. They look like large Brillo pads, or maybe natural loofah. The seaweed that grows here combines with the sand and the water to make these useless but interesting natural objects. 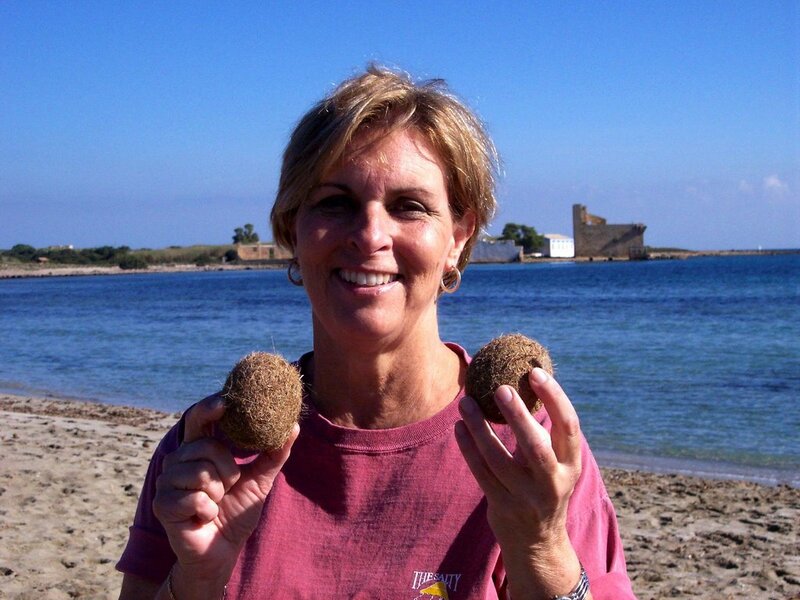 Here is Susan holding two of them with the old tuna factory behind her. 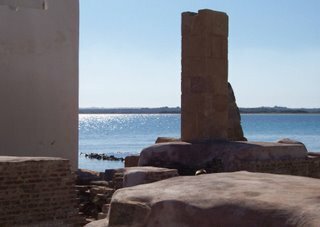 And last, the picturesque ruins of the old tuna factory are on the property and worth a visit. It's been a long time since tuna was caught and processed on this side of Sicily; in fact, the factory closed during WWII. Anyway, here one can see the remains of the operation including the huge brick ovens where fires were stoked for the processing of the fish. Nowadays, it's a very lovely sun-washed ruin with a castle-tower that might be Schwabish attached to it. And, it's right on the water, that beautiful, clear, blue Med! By the way, Vendicari is free of charge but there are restrictions about what you can bring in and what you can do. It's small enough and easy enough to walk from one end to the other and see the different areas, enjoy the water, the history, and the birds.